Corporate events are all about branding. Everything you choose to fill the evening with – from the entertainment to the decorations – will send a message about your company to everybody present. Branding is also the way businesses give themselves a personality – something unique that competitors and customers can recognise and respond to. Here are some event lighting tips to make sure the message you’re giving across at your next corporate event is both personal and professional! Nothing is more personal that a company’s logo. It is an integral part of any business’s image. 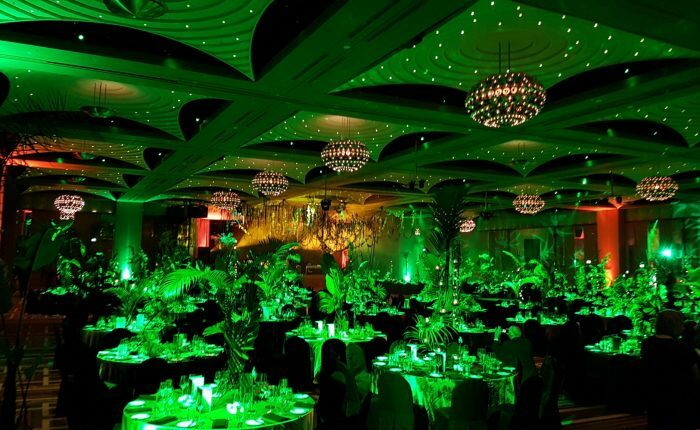 So, why not make it an integral part of your event’s decorations? At Pro Light & Sound, we can project your company’s logo through a light fixture in a way your attendees will never forget! Whether you want you logo projected on the side of a building, the walls or floor of your event venue, or anywhere in between – we can help you out. And, if you want to take your logo to the next level, we can even project it using a moving light – to perfectly reflect the dynamic nature of your company! We can also make it change colour. All in all, these visual services offer a stunning and memorable way to get your logo – and therefore your brand – stuck in the hearts and minds of your guests. Every corporate event needs lights. There are no two ways about it. However, what you do with those lights can show the world – or, at least, everyone you’ve invited – what your company is all about. If you want your business and its employees to come across as fun, energetic and modern, why not try a colour wall wash or moving lights? These will give your event something of a non-formal “party” atmosphere, making your guests feel relaxed and ready for a good time! However, you may be organising a classy, formal get-together. If this is the case, we suggest installing chandeliers (which we stock in a variety of colours) or – if your event involves speeches or performances – a stage spotlight. Whatever your business’s personality, Pro Light & Sound has the right audio visual equipment to make it shine! Get in touch to see how we can help your corporate personality shine through!